On August 16, 2018 at approximately 1:10 am, The Township of Hamilton Police Department received a 9-1-1 call reporting a fire in the area of West Point Ave and Fulton Ave, in the Mizpah section of the township. Patrol officers, along with Mizpah, Mays Landing and Laureldale Fire Departments, responded to the area and located a shed on the 1300 block of West Point Ave, on fire. The fire was quickly extinguished and no injuries were reported. 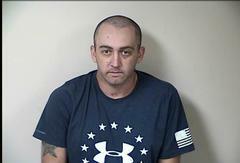 During the investigation Matthew Hesser age 35 of Vineland (the original 9-1-1 caller) was identified as a suspect. Hesser, who is a Mizpah firefighter, responded to the scene and assisted with extinguishing the fire. On September 13th, Matthew Hesser was interviewed by detectives and was ultimately charged with arson (3rd degree) and criminal mischief (3rd degree) for intentionally starting the fire. Matthew was released on a summons pending a court appearance, per criminal justice reform. Also assisting with the investigation was The Atlantic County Prosecutors Office (Arson Unit), State of New Jersey Division of Fire Safety (Arson Unit), Township of Hamilton Fire Safety, Alcohol Tobacco and Firearms (ATF), and the New Jersey State Police.